Beginning in midlife, it’s common to face a number of age-related issues, such as chronic pain, hypertension, heart disease, osteoporosis, arthritis, and anxiety and depression. Managing the physical and emotional challenges that come with aging can be difficult. The good news is that yoga is extremely beneficial for a wide variety of age-related ailments and can lead to greater flexibility, balance, and overall well-being. 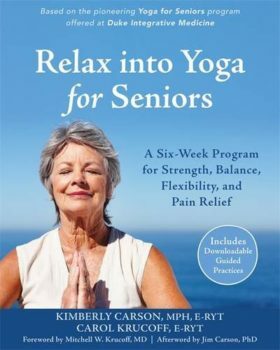 Based on the pioneering Yoga for Seniors program offered at Duke Integrative Medicine and the Kripalu Center for Yoga and Health, Relax into Yoga for Seniors presents a unique yoga practice just for you. This book guides you through a gentle six-week program that takes your personal limitations into consideration. With step-by-step exercises and posture illustrations, you’ll create an evidence-informed yoga practice to address your needs, relieve pain, and help you to become more vital. You’ll explore what yoga is and how to do it safely, including important movement considerations like how to get up and down from the floor with care, and how to stand and sit with healthy postural alignment. If you’re looking for a simple and effective yoga program, this book has everything you need to get started today.